On 23rd June, every one of us will have the chance to decide for ourselves whether to cast our votes for or against Britain remaining in the European Union. It is a big decision and it is a tough one. Talking to people around here in the last few weeks, though, I know that people are getting really fed up with the bitterness and backbiting that has often disfigured the debate. People also tell me how frustrated they feel when both sides bombard them with what they claim are “facts” but which are so contradictory that they end up creating more fog than clarity. As your MP, though, I want to know what you think, and to do what I can to help you cut through the fog to make the decision you think is right. That is important whether or not you reach the same conclusion as I do. It would be great if you could fill out my short survey on the EU. You can do so here. That’s why I am also hosting a community meeting so I can listen to your thoughts and talk openly and frankly about the choice we have to make. If you would like to attend the community meeting, or request a paper copy of the survey, please email me at: richard@richardburden.com, or call: 020 7219 2318. If you scroll to the bottom of this post you can also see a number of other events taking place locally or on TV that may interest you. I realise the concerns people have about the European Union. It is true that the EU is far from perfect and there are lots of things which need to change. But when I cast my vote as an individual, I will still vote to remain part of the EU. To me it makes sense to do that for jobs, for our security and for future generations. Like it or not, in the 21st century big issues we face like inequality, migration, climate change or terrorism, cannot simply be tackled country by country. We have to talk to our neighbours and leaving the EU would not change that reality. To me the real danger is that by leaving the EU we would be left on the side lines – affected by the big decisions but not able to influence them. Take migration – something I know from my Northfield Talks consultation in January 2015 that local people feel strongly about. The world has never before seen anything on the scale of the hundreds of thousands of people who prepared to risk their lives travelling thousands of miles to flee war and poverty. Of course there are issues to address about the rules covering where EU citizens can move and work in Europe. But most of those fleeing conflict and extreme poverty come from beyond the EU, not from inside it. The UK already has control of our borders in these circumstances – that’s why the refugee camps are in Calais and Greece rather than here. But we are still affected – at a human level when we see children die in Mediterranean – and we are affected by the consequences for the global economy and for security. Yes, faced with mass migration from beyond the EU, we should not give up the ability to make our own decisions about our own borders. But in responding to things that cause such huge changes in our world, I also think we will achieve far more if we have the confidence to lead in Europe, not to leave it. That is not the UK losing control of our future. It is seizing the opportunity to shape it. And then there’s jobs. Almost half of everything we sell as a country we sell to Europe. That’s things like cars, pharmaceuticals and digital services. I genuinely believe British industries would suffer as it becomes harder to export British goods if we leave. We are already seeing uncertainty about the future hitting our economy. I believe a Leave decision would make that worse, leaving families here worse off with rising prices, higher mortgages and without the safety net that being in the EU has often given us, for example on working conditions, maternity leave and holidays. So these are some of the reasons why I think leaving the EU would be wrong now and why doing so will reduce opportunities for the next generation here in South West Birmingham. We all must make our individual judgements about these things but I want to be straight with you about mine. 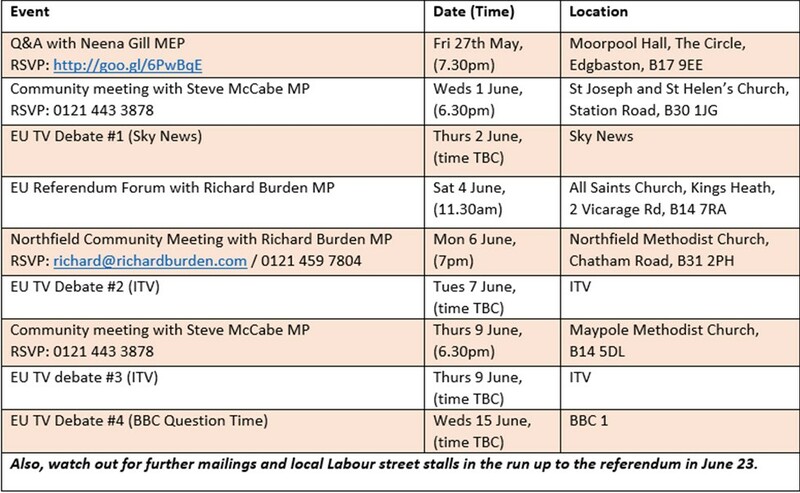 Please tell me your views too filling out the survey – and I hope to see you at the community meeting on 6 June. Don’t forget that to vote, you, your friends, family and neighbours have to register as individuals. Doing so only takes minutes – all you need is your National Insurance Number, follow the link here: https://www.gov.uk/register-to-vote. Please do it now. 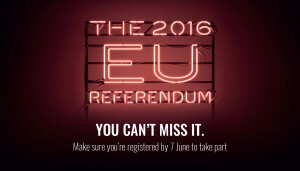 To vote in the referendum on 23rd June you need to register by 7th June. In the quest for facts, below are a number of websites – and even an app – that provide useful information and go some way to addressing the myths being peddled in the debate.